The best agile book isn’t a book: Agile in a Flash is a unique deck of index cards that fit neatly in your pocket. You can tape them to the wall. Spread them out on your project table. Get stains on them over lunch. These cards are meant to be used, not just read. Agile in a Flash is no longer sold as a printed deck of cards. The PDF version is available, and you can use the PDF to print your own card deck. Bite-sized! Read one practice or aspect at a time in just a couple of minutes. Smart! Each card has years of practical, real-world experience behind it. Portable! Cards fit easily in your pocket or backpack. The Agile in a Flash deck is broken into four sections: agile concepts, planning, teamwork, and coding. The front of each card features a concise list of the concepts you need to know and remember. The back provides further detail, with sage nuggets of knowledge based on the authors’ two decades of experience coaching and doing agile-style projects. These cards are an indispensable tool for any agile team, and a must-have for every agile coach or Scrum Master. Don’t be afraid to wear them out—they’re priced so you can get a set for everyone and replace them if you need to. 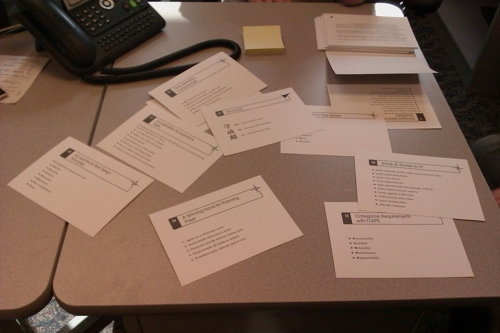 Tape the cards to your wall, stick them on your monitor, quiz your peers, and get agile fast. Actual picture of Agile in a Flash cards in use! What’s the deal? Watch this video on YouTube. Jeff Langr has been building software for more than a quarter century. He is the author of Agile Java and Essential Java Style, plus more than 80 articles on software development and a couple chapters in Uncle Bob’s Clean Code. Jeff enjoys helping others learn how to build software well, but is happiest when he gets to code. Tim Ottinger has more than 30 years of software development experience, including time as an agile coach, OO trainer, contractor, in-house developer, and even a little team leadership and management. He is also a contributing author to Clean Code. He writes code. He likes it.